There’s more after the jump. Hang in there a minute while we walk through this: Scrubs left NBC shortly after the writer’s strike with a dismal series finale. In 2009 they are coming to ABC, Jan 6th, for a new season. Now, Zach Braff is saying that he’s outtie after this next season b/c there’s more stuff that he wants to work on. (i.e. Garden State 2). Again, I’m celebrating by having brinner for another week straight – maybe I just like brinner. TIP, I was OK with your cameo on Chelsea Lately and Sesame Street, but I’m not sure how I feel about you promoting for NBC. It’s not b/c I don’t want you to get the limelight you deserve however I just think it looks like you may be on a ‘needy’ paper chase prior to serving those two days for what-had-happened. On the posi-tip, I bet they won’t bump your performance time for Bumbershoot in 2010. 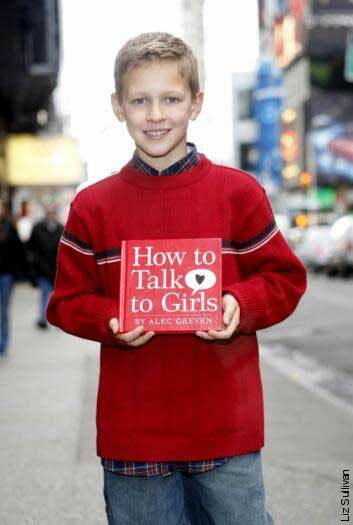 That’s what he said, no really – that’s what this little, punk kid said in the book he just published, How to Talk to Girls. My question is how this lil guy got published: Did he win a coloring contest at his local Albertson’s or something? Why can’t I get this song out of my head!!! And, did anyone else notice how close to the edge of offensiveness this other freecreditreport.com commercial came in that it represents all their fraudsters with a common thread of diversity…? Republican Propaganda Machine – Once again, I’ve spotted you!